Until Steve mentioned it on a gallery comment I'd never heard of Tri-Bo locomotives. Plenty of "Tri-Bo's" in Switzerland. Known as Re6/6. Closer to home the Channel Tunnel shuttle locos are also Tri-Bo. The Tri-Bo is mostly a narrow gauge contraption. A number were built for Japan and also Kiwiland for the 3 foot 6 inch. The advantage of a tri-bo over a standard Co-Co being that flange wear should be reduced. The middle bogie is normally floating. The QR electric locos are tri-bos, again for 3 foot six inch. With almost constant curves on the NSW Blue Mountains, it was believed that the tri-bo design would provide for less flange wear and wheel creep. But, I can attest that 8650 did yaw and sway all over the place. Quick give me the sea sick pills. It was never adjudicated as to whether the tri-bo design performed any better. Sadly, as with most of our once magnificent electric loco fleet, 8650 is shoved out at Broken Hill rusting to the rails. 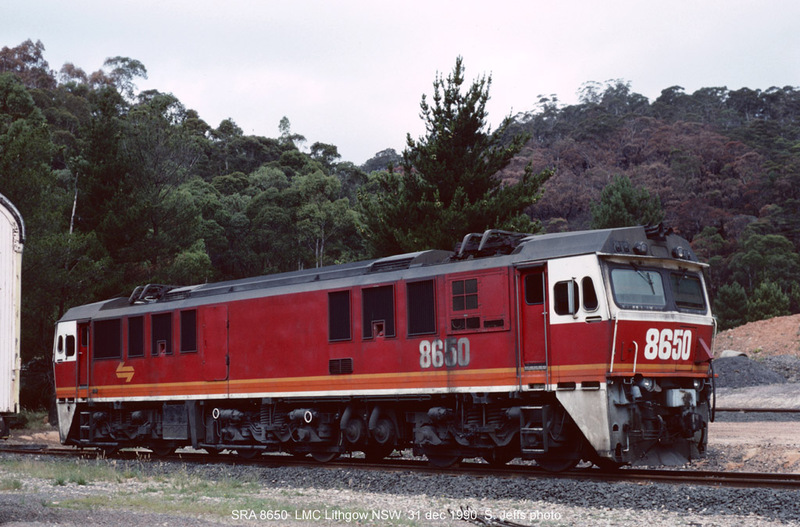 Just uploaded a photo of 8650 at LMC Lithgow in 1990.